When we adopted Penelope everything happened really fast. I mean REALLY fast. We had only been signed on with our agency for a few weeks when we got the first call about a potential match, and then just a few weeks after that we got our next one. THE one. From the time we got that phone call until the moment we held Penelope in our arms was 9 days. We were told on a Wednesday that they would be presenting us to this birthmom. THE NEXT DAY, less than 24 hours later, we were told she had chosen our family for her baby. Over the next 8 days we traveled to San Jose to attend my cousin's funeral, cleaned out the nursery of the many boxes that had been dumped there when we moved into our house three months earlier, painted the nursery, painted furniture, went on a serious baby shopping spree to stock up on the items we hadn't needed in 7 years, made travel arrangements, borrowed snow gear, packed and left for Utah. 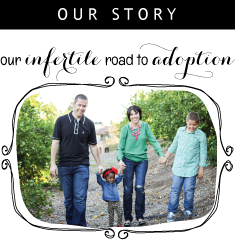 So even though we had waited for almost 8 years to have a sibling for our son... the adoption process felt like a whirlwind. This time around feels very different. It has only been a few weeks since we have been considered a waiting family, but we have already been presented with five potential matches. That's already three more than we had with Penelope. And we are still a waiting family. And these birthmoms are not local to our agency, so not only are we having to wait for them to make a decision... we are having to wait for them to even receive the profiles in the mail before they can make their decision. Days feel like weeks. I know that God knew which baby will be ours before we even decided to adopt another baby. I know that. And I trust that. I think I've said this before in a post, but I TRULY appreciate you blogging about your adoption experience. We will be going to our first informational meeting in Nov and I pray taking the first steps to starting this journey. And for a long time I felt very alone - and all of a sudden I found all these blogs and communities that are talking about adoption and that is not a coincidence. It's all part of Gods plan for me - to ease my anxiety and give me some peace. Praying for your family. Every time I look at your profile I think - what a sweet family, they look like such nice people. Praying your wait is not much longer. Your attitude is perfect. We have been a waiting family since July 1. Our agency is much smaller and therefore we aren't shown as often. But for reason, I just felt like it would go fast. I had two friends adopt in the last ear, both were matched within a month (one on the day they turned in their profiles). I know it's all in Gods timing but I can definitely feel for you! Good luck!! "Unanswered yet? Faith cannot be unanswered. She knows Omnipotence has heard her prayer, And cries, 'It shall be done' -sometime, somewhere."